The Decked drawer system is incredibly easy to install and is a great in-bed system for keeping organized. Each drawer holds up to 200lbs of tools and equipment, and it sits down inside the bed, giving you optimal space for large items. The drawers also lock to keep your equipment safe. We carry the Cap-Pack Sport to keep your equipment organized, and up and out of the way. 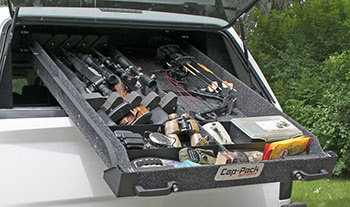 This storage system is easily mounted to the roof of your truck cap, and offers easy access to all of your tools. Contact Cap Connection to for product info or to check which storage systems we have in stock right now.